Not since the Egg Cream (a beverage that contains neither egg nor cream) has a food item been so mis- named as the poor hard-boiled egg. That's because to make the best (non-rubbery, no green/gray yolk) hard-boiled eggs, you really shouldn't boil them barely at all. That's right- you heard me, barely any boiling, people. 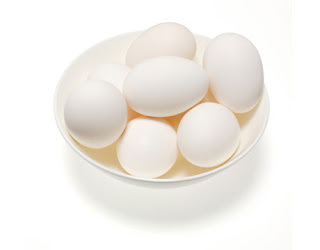 Place the eggs in the bottom of a saucepan (room temperature eggs are less likely to crack than cold ones) and run enough cold water over them to cover them by 1 inch. If you want you can add a teaspoon of salt to the water, to make them easier to peel. This sounds gross, but eggs that you've had in your fridge for a week or so will also peel a lot more easily than super-fresh ones. Place the pan over medium-high heat and bring just to a boil. Immediately cover and turn off the heat. For hard-cooked eggs, let sit, covered, for 17 minutes (for soft-cooked eggs let sit for 5 minutes), then drain the hot water, and run cold water over the eggs until cooled (or throw a bunch of ice cubes in with them). Keep them refrigerated, and they'll be good for at least a week. 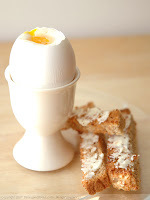 I love a soft-boiled egg with salt and pepper and a slice of good toast for a simple, easy, and delicious breakfast (or even lunch). I throw hard-boiled eggs into salads and eat them raw for a snack. I also make a mean egg-salad, and heavenly deviled eggs (ha-get it? ), but those recipes are topics for another day. Let's just master the basics first, shall we? 'Heavenly Deviled-eggs, eh? Gads, you are just like your Father.